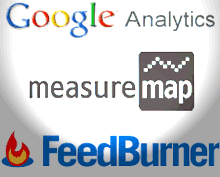 Two years ago, Google bought Measure Map, a very intuitive analytics software for blogs designed by Jeffrey Veen. Since then, Google Analytics borrowed some elements from Measure Map's interface. It seems that the transition is about to end soon as Google Analytics will integrate Measure Map's functionality: blog stats. Measure Map users received an email that instructed them how to access the new version of the software. We're giving our earliest users of Measure Map an opportunity to use our new service, built on the powerful Google Analytics platform and continuing to use the interface you're familiar with. 1) Create an account at Google Analytics. 2) Install the Google Analytics tracking code on your blog. It's clear that the standalone Measure Map is history and all of its features will be added in a new Google Analytics section for blogs with information about comments, links from other blogs, popular posts and, hopefully, real-time stats. FeedBurner is also a good candidate for integrating with Google Analytics and providing the big picture of your blog's traffic. Another good news is that Blogger users will finally have a stats panel that can be accessed directly from Blogger's interface. Hopefully, Google will also include options like showing the number of views for each post or adding a list of the most popular posts in the sidebar. Recently at South by Southwest, we announced our new Google Analytics for Blogger reporting interface. This integration marks the transition of Measure Map users worldwide to a new Google Analytics interface specifically designed for Blogger users. We've rebuilt Measure Map as an integrated feature of both Google Analytics and Blogger, which will give bloggers daily stats such as the number of visitors they receive, how many posts get traffic, and new referring links. Users can also use Google Analytics, of course, to track their blogs. More information is available on our Help Center. We'll be refining the new interface in the coming months before we release it to the general public, and we're excited to help bloggers further understand the impact they're having on their readers. Update 2: Google Analytics Blog has a screenshot of the Blogger integration. Google says it "will support all blogging programs. Bloggers who don't use Blogger will see a new reporting interface that resembles Google Analytics." I'm already using the usual Analytics with Blogger, just editing the basic the template. Can't see the plus factor. I reworded that part, but I don't think it's incorrect. "Suffer a transformation", "suffer a change" etc. I'm really looking forward to seeing this in action, Ionut. At present I need to visit a few different places to get the full picture of my Blogger blog's statistics, and this will be a welcome addition to Blogger's interface once it is brought into effect. Do you think this will roll in through Blogger in Draft first, or be implemented straight in? Google Analytics is an informative tool yet there seems to be one problem. Some Internet Security software tools and the latest versions of IE unwittingly warn readers that pages with Google Analytics in the code are possible 'phishing' sites. I tried many trffic monitoring tools and websites but find google analytics as the most accurate of them. any word on the analytics for blogs moving into mainstream??? I'm ready to use this new fuly integrated GA tool for Blogger! Any news on when it might be released? Maybe room in the private beta?!? Google Analytics is an informative tool, Every persom knoew about the Google the it is very big search engine,and i will say first of all that the polices of the Gppgle,s administrater is very good. The thing about analytics is that it give you all the info in a very basic and combined way that you will never have to move here and there. also you can put as many domain in your analytic account as much you want so the access is too easy to all your sites. I have checked many webmaster related tools but g.anaytics is the best for me, because its free as well as professional for doing all the stuff you want to know about your site.